AirZone HVAC Services provides hot water heater installations to the greater Ottawa area (including the Ottawa Valley). We supply, install, maintain, and repair all brands of hot water tanks and tankless products. We offer an affordable and reliable rental program for hot water tanks alongside our financing and purchase options. We specialize in energy efficient wall mounted instantaneous hot water tanks that start at only $39.99 per month (plus HST). Click on the Bosch logo to view the instantaneous tanks available to use through our supplier. We work with a local credit company to approve your hot water tank easily, quickly, and often without a credit check! We have the ability to add your hot water tank rental to your gas bill! We want the best for our customers! A tankless hot water heater has many benefits including exceptional energy savings, durability, and increased safety. New and innovative products in our lineup have options such as smartphone enabled units allowing for remote operation and notifications. A tankless hot water heater replaces your large water drum with a much smaller wall mounted unit. This unit allows water to pass through it heating it on demand. A drum tank continually heats water regardless of whether you are using it or not. A tankless system only heats the water when you need it and provides a continual source of hot water so you never run out. Due to their energy efficiency, the higher cost of a instant unit will be offset by utility savings. The cost will be further offset by the longevity of the unit. Drum hot water heaters have sediment buildup over the years reducing their lifespan. Instantaneous hot water heaters have no sediment building and often can be repaired instead of replaced (unlike drum tanks which almost always require replacement). Are you a fan of Myth Busters? There is a very popular episode where a hot water tank is pressurized to the point of rupture resulting in a missile like effect. Although this is an extreme example, instantaneous tanks are much safer versus drum tanks since they are not under pressure. In Ottawa, drum hot water heaters have been the go to product for many years. We supply and install a full line of drum hot water heaters for your home. We also offer a repair service for your current tank. Price is usually the main factor when choosing a drum hot water heater over an instant tankless design. We offer competitive pricing along with financing and rental options on high quality drum heaters. Renting provides a worry free approach, and financing can save you money over the term. At AirZone, we size your hot water tank correctly to balance hot water supply and efficiency. Our products also deliver very good energy efficiency and our financing option does not lock you into any long term contract. If fact, you can pay off the balance at any time. A hot water tank is a cylinder tank product that is installed in your home. Cold water from your water supply fills the tank and is continually heated. There are two main methods for heating the water depending on which type of product you have purchased. The first type is a gas heater contained within the unit. This uses your homes gas supply to heat the water from the bottom of the tank. Note that a gas powered (either propane or natural gas) hot water heater requires an exhaust to remove gasses after combustion. The second method is an electrical hot water tank with heating coils at the top and bottom of the tank. This type of tank does not require an exhaust. In Ottawa, gas tanks are more popular because they offer better efficiency than the electrical heating system. This is also dependent on which type of fuel is supplied to your home. Both electrical and gas hot water heaters contain an adjustable thermostat so that you can choose how hot the water gets in your home. By adjusting the thermostat you can balance your hot water needs with energy efficiency. Turning down the thermostat is also a great way to protect children from hot water from a faucet. After the water is heated in the tank, it exits the unit through a hot water line connected to your hot water plumbing lines. Q: Why should I buy or finance a hot water tank as opposed to renting one? A: AirZone HVAC Services offers three options to have a hot water tank put in your home. You may simply purchase the tank and pay for the installation services, finance the cost of the tank through our credit partners, or rent the hot water tank. Although each situation has its advantages, we recommend the financing route. This option offers a low monthly payment for your hot water tank and will save you money in the long run since you will own the unit outright. It also has the advantage of unit ownership if you sell your home since you won’t have to pass the rental cost on to a new homeowner. Q: If I am renting a hot water tank and I sell my home, what happens next? A: This situation happens commonly in the Ottawa marketplace. Homeowners are generally used to switching over a hot water tank rental to a new home buyer. This process is easy and straightforward, however if you prefer you may also buy out your existing tank at any time. Q: What type of tank will you put in my home? A:We only install Energy Star qualified water heaters for our customers. This ensures that you will receive the highest possible cost savings on your utility bills every month. We rent hot water tanks with a high energy factor (EF). We would be happy to show you all of the statistics for your new hot water tank. Simply send us an email or call us at 613-592-5770 for more information. We are always committed to delivering the latest technology when it comes to hot water heating. We are very excited about the arrived of the Bosch Greentherm 9800! 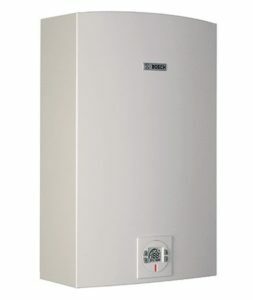 This is a top of the line tankless hot water heater with a number of changes from past models. First, the water connections have been relocated to the top of the unit allowing for an easier and more cost effective installation. This is a benefits for the homeowner because it provides installation options that were not available before. Second, this hot water heater works with your smart home allowing you to control the water temperature and receive alerts. One of the nice things about this unit is that replacement parts are readily available. Unlike drum hot water systems, this tank usually can be repaired by replacing inexpensive parts rather than replacing the whole unit. The most impressive feature of this hot water heater is that it delivers an unheard of 99% thermal efficiency. This significantly offsets the cost of the unit through utility savings each year. By installing this hot water heater you will be helping the environment by reducing your footprint and enjoying energy savings along the way! Financing is a great option for the Bosch Greentherm 9800 models. This helps to balance the cost of the unit with the energy savings. You will get all of the benefits of this hot water heater and when considering the energy savings you will get all of this at a very affordable price. Our customers love the fact that this unit is extremely small when compared to drum products. It can be wall mounted and free up additional space perfect for storage in your home. We are a family business dedicated to the highest level of customer service. Part of this dedication include delivering quality products that homeowners will be happy with for many years to come. We consistently deliver high quality workmanship paired with high quality products. We guarantee our work and are proud of our quality you can trust guarantee. AirZone has been operating in the Ottawa are for over 10 years. We have built a strong reputation for quality work backed with many reviews; both old and recent. When you choose us for your hot water heater installation, you are supporting a family company who not only appreciates your business, gives back to the community, and consistently provides the highest level of customer service in the industry. Our hot water installation team is directly employed in order to ensure quality installations. We keep an A+ rating with the Better Business Bureau and are in good standing with the WSIB. We offer very competitive pricing without using any of the negative pressure tactics seen in the hot water industry (such as pushy door to door sales). We believe that our approach stands out and we never take advantage of consumers. Thank you for considering AirZone for your hot water heater installation!